This book sets me thinking about what ingredients must be mixed together to make a good legal thriller. Let’s start off with the obvious. At some point before, during or after the book starts, X must break the law and require the services of a lawyer. We are then allowed the privilege of watching said lawyer from the moment of initial advice through to the trial at the end. Although the court room scenes are not mandatory, there must be a good reason for the case failing to come before a judge so said lawyer can demonstrate just why he or she is in such high demand as a trial lawyer. On the way to the legal and thrillerish denouement, our heroic legal manipulator must face dangers. Others in the entourage or potential witnesses are expendable but, of necessity, the legal eagle must fly unscathed in the physical sense (although it’s appropriate from there to be some running, hiding and the occasional blow struck — some lawyers even pick up the occasional bullet wound as a trophy). Those of you with some legal knowledge will understand the theme of this book from the title. 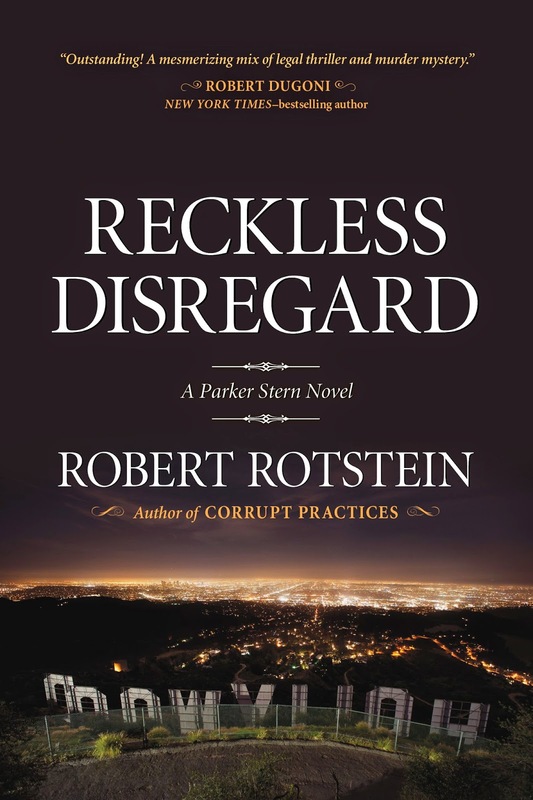 Reckless Disregard by Robert Rotstein (Seventh Street Books, 2014) is about defamation. In this instance, it’s alleged the latest video game from an anonymous underground designer libels a famous Hollywood movie producer. Under American law, it’s necessary to prove the publication of the images and words was malicious. That means the publisher must have shown reckless disregard for the truth, i.e. at least willful blindness. In theory this should be relatively straightforward given this game designer has alleged the movie producer kidnapped and killed an actress. Anyone looking in the historical record would find no mention of said producer ever having anything to do with the actress so here comes a man with one of these apparently unimpeachable reputations to sue an underground revolutionary who dares attack one of the titans of the movie industry. Needless to say, the only person standing between David and Goliath is our series hero, Parker Stern. To put it mildly, he’s not the strongest of performers having lost much of his trial mojo through increasingly severe anxiety attacks. However, this time he’s motivated to take the case because Lovely Diamond is the attorney of record on the other side. Those of you who have read the first book will know our hero and Lovely ended up an item. In the intervening period, she has broken off the relationship leaving our man somewhat puzzled and deflated. This is not so much a chance for revenge but an opportunity for them to interact again, even if only from opposite sides of the courtroom. He’s not sure what, if anything, will follow on from this, but he feels he has to try. So this part of the book is a great success. Having adopted the cliché of pairing them off, our author now has them as wounded warriors. Since both have their secrets, it’s interesting to watch how they slowly grow more comfortable with each other again. The plot is also very cleverly put together with some nice twists and turns when we get into court. The unravelling of the core mystery about what might or might not have happened to the missing actress is engrossing. The only problem I have is with the game itself. A not inconsiderable amount of time is devoted to describing the different levels and showing how the game apparently tracks the real world events. I’m not a game-player so I can’t speak for the credibility of this as a real-world game. So I accept such a game might have a cult following and confirm it as an ingenious way to set the hare running to see which dogs try to chase it down. But I have a problem with the later explanation for the game showing one of the murder scenarios, apparently before the murder(s) occur(s) or is/are discovered. The game designer or other(s) helping him/her must have had a good idea how this element was introduced into the game. Yet the designer’s failure to resolve this issue becomes the second reckless disregard. The first is publishing the game knowing there’s no positive evidence to prove the kidnapping/murder ever took place. The best state of the evidence is as a basis for undermining the reputation of the movie mogul. The second is either the designer becoming a murderer or concealing the identity of the murderer. So we’re left in a very interesting state. Through one of the quirks of examination and cross-examination in trial, Parker Stern’s secret is revealed. Perhaps this will help restore his trial mojo. The relationship with Lovely may be repairable despite the presence of the game-playing son. And a version of justice is achieved so far as all the public and the police are concerned. Putting this together, Reckless Disregard is a very good legal thriller, doing clever things to mix all the ingredients in a relatively new way. But it’s not as good as the first in the series. This is slightly more contrived. For a review of the first in the series, see Corrupt Practices. 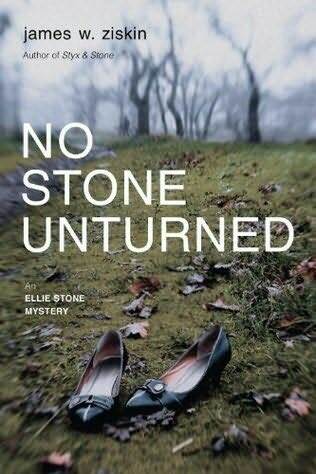 No Stone Unturned by James W Ziskin (Seventh Street, 2014) sees the second appearance of Ellie Stone, a young woman driven by the need to prove herself in a 1960‘s society that has still to embrace the notion of gender equality. She’s currently working in the small town of New Holland in upstate New York at The New Holland Republic, but finding it very difficult to be taken seriously as a reporter. Not surprisingly, given the era, Artie Short, the owner, tends to give preference to unimaginative, by-the-numbers George Walsh. This has been grinding down our heroine, so hearing the discovery of a body on her scanner gives her the chance to be first in the queue when it comes to getting the inside story. The body proves to be Jordan Shaw, daughter of the local judge and respected attorney. It was was discovered half-buried in the woods, having previously occupied a room at the somewhat notorious Mohawk Motel. To her surprise, the Judge formally asks her to investigate. It’s not exactly that he has no faith in the local sheriff to discover who killed his daughter, but he reasons it can only help to have a second string to his bow. In making this choice, he’s relying on his inside knowledge of her success in tracking down her father’s killer in the first book. This doubly motivates her. 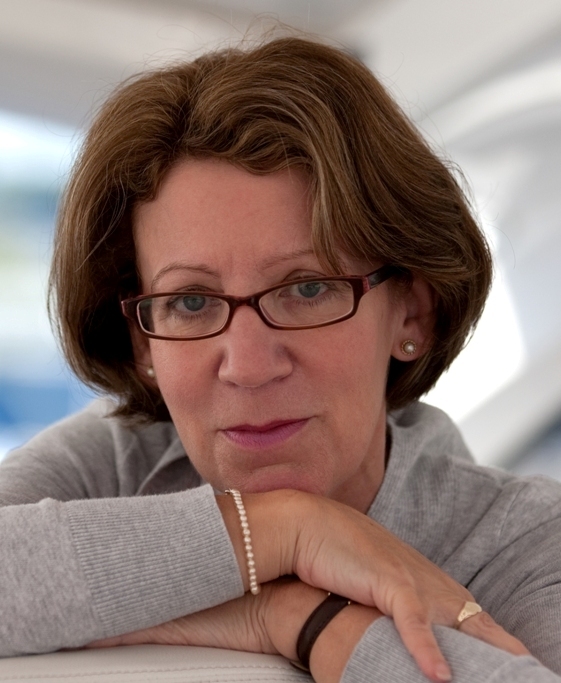 Obviously she sees the story of her investigation as being her foot in the journalistic door and, if she can also get the judge’s backing, there may be other opportunities flowing from the social and political connections. With her trusty camera always to hand, she takes photographs of everything that may prove significant. Once in full flow, she’s an unstoppable force, identifying the present whereabouts of the Shaw’s family car and then beginning to piece together what happened at the Mohawk Motel. However, it’s when she travels into Boston that we get to see her determination as, confronted by a locked door, she calmly picks up an axe and discovers the next body. Needless to say, she’s in full photographer mode as she waits for the police to respond to her call. Then it’s off to Tufts where Jordan Shaw was a student. At this point, the plot takes off into pleasingly complicated territory as our journalist/reporter has to work out what the relationship is between the lives the two girls might have had in Boston and in New Holland. There’s also a diary to puzzle over with lots of interesting notations and significant initials. Sadly, she becomes the trigger for a slightly heavy-handed portrayal of the Indian/Pakistan hostility through the palpable tension between Prakash Singh and Hakim Mohammed at Tufts and, later, in New Holland. This plot element and the emerging debate about birth control form the time-specific links to 1960. Although our heroine is attacked and, in a separate incident, almost dies, there’s a distinct pulling of punches when it comes to dealing with the sexism of the time. The racism against the Hispanic community also feels sanitised. More importantly, even more than in the first book, the first-person narrative featuring Ellie lacks credibility. 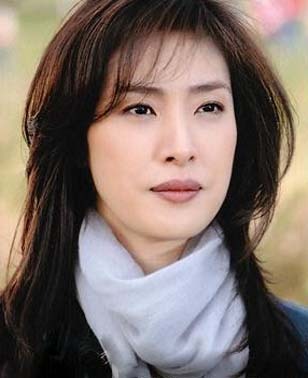 Although she functions very well as an investigator and solves the various crimes including the two murders, it could just as easily have been a young man. Yes she does flirt a little and is physically vulnerable, but this is very much a man’s view of a woman’s internal monologue. This leaves me with slightly mixed feelings about the book. As a murder mystery, it’s a nicely constructed plot with suspects serially eliminated as the pages turn. The thriller element of the young woman who survives assault and attempted murder is also reasonably persuasive. But the sense of location in 1960 is not quite as successful as in the first book and the characterisation of Ellie is more perfunctory. So if you’re prepared to view this as predominantly a murder mystery with only a faint historical veneer, you’re likely to find this at least as enjoyable as the first in the series. But if you were expecting there to be a step forward in developing the historical themes and watching a young woman try to be ahead of the curve as feminism begins to develop a more positive edge, you’re likely to be disappointed. That makes No Stone Unturned good but not as good as it might have been. For a review of the first in the series, see Styx & Stone. Back when I was young and still somewhat naive, I was rather taken by the idea of history following a cyclical pattern. I think I first encountered the idea in The Voyage of the Space Beagle by A E van Vogt. At the time, I was studying the classical languages at school and had read Gibbon’s Decline and Fall of the Roman Empire which was a somewhat ironic book for a European historian to be writing as the then major European powers were full of optimism and engaged in creating their own Empires. But the idea of a man writing about the fall of one empire as all the other emergent empires were doomed to fall seemed eerily prescient. Anyway, my understanding of history did seem to register Golden Ages followed by Dark Ages as different civilisations rose, prospered, and then fell. It also seemed attractive to believe that, after each Dark Age, the next civilisation would be better than the last. Young people always want to believe the later generations learn from the mistakes of the earlier. Sadly, that’s rarely the case. As each society reaches the point where agriculture and raw material resources can no longer support the local population, there tend to be wars and social collapse (if climate change wrecks enough of the world’s agriculture, the next collapse may not be very far away). 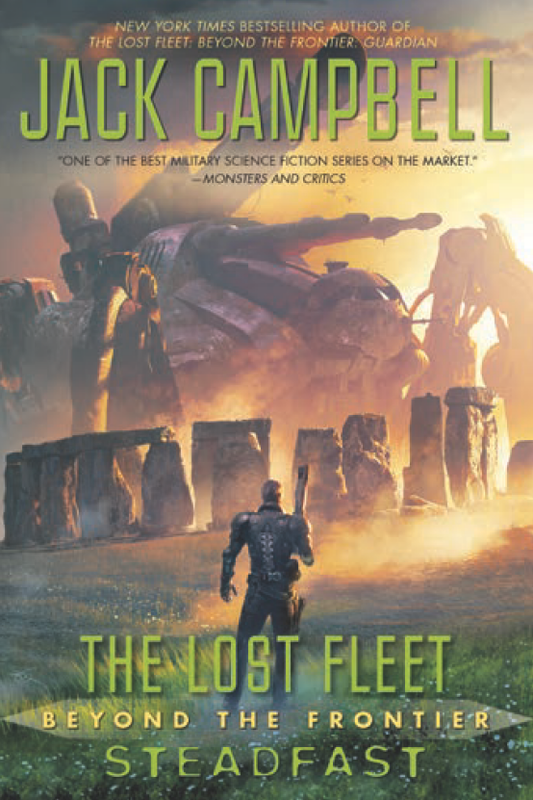 The Lost Fleet: Beyond the Frontier: Steadfast by Jack Campbell (pseudonym of John G Hemry) (Ace, 2014) is rather elegantly playing with this idea as John “Black Jack” Geary begins the book doing a tour of Earth (as the cradle of the now interstellar civilisation). Appropriately, he’s visiting Hadrian’s Wall in the North of England close to where I was born (not, you understand, that I was there when Black Jack visited). There’s much for him to chew on as he considers how the wall came to be built and, more importantly, why it was later abandoned and largely allowed to collapse over the centuries that followed. He also views other sites where the damage caused by the collapse of an empire remains as a reminder of past failure. He sees this alongside his own experience of helping the Alliance beat the Syndicate and then fight off aliens who might have done considerable damage. The state of the two human combatants remains fragile with the Alliance caught in a difficult economic situation as their worlds try to shift from a war to a peace footing. The Syndicate has fragmented with many planetary systems going through local rebellions against the old regimes who continue to holdout. No-one is doing well in this situation. The book is full of discussions and insights into the collapse of order on both sides of the political divide. Before the war, there were political tensions but, along the border between the two sides, there was considerable trade and movement of people. Now that the war is technically over, there are the usual problems of recovering prisoners of war and dealing with refugees and economic migrants whose arrival from Syndicate space is stressing the resource-poor economies on the Alliance side. This leaves Black Jack with two major issues to address. The first is the enigmatic presence of six ship from the alien race called the Dancers. Their command of standard English is no doubt good, but they choose to communicate in a very odd way. Indeed, the retired general who’s been given the job of liaison officer finds trying to get anything approximating a straight answer out of them a challenge. Nevertheless, there does seem to be some method to their alien strangeness as they suddenly take off on an apparently random tour of human space with the general in tow. Fortunately, it becomes clear towards the end of the book that they have been able to see signs all is not well in human space. The second issue relates to the extraordinary secrecy surrounding some of the activities of the Alliance. It seems factions have been taking long-term decisions without any public disclosure let alone discussion. Until the end of this book, it’s not entirely clear exactly what’s been done. Now we have a better view of the outcome, it’s obviously a disaster that’s waiting to rampage out of control. As a warning sign of the capacity for decision-makers to believe they are doing the right thing, we get an early visit to the moon of Europa where a secret lab was trying to create the perfect bio weapon. Unfortunately, it escaped the lab and everyone of the moon died. A permanent exclusion zone has been established and no-one is allowed to visit. This latest discovery may well be characterised as an infection of sorts. It will be interesting to see how Black Jack deals both with the politics of how such a thing came to be created and, more importantly, what’s to be done about it now. Putting the problem shortly, the Alliance and the Syndicates had some degree of stability through maintaining the status quo of the conflict. When Black Jack broke the impasse, the Alliance feared for its own stability as victor. Those who had been leaders on a wartime footing might not maintain their hold over power if there was a return to peacetime democracy. For some this would be unendurable. Such is the way in which leaders sow the seeds of their empire’s fall. Putting all this together, The Lost Fleet: Beyond the Frontier: Steadfast is rather a thoughtful book with quite a lot of fighting for those who like military SF. 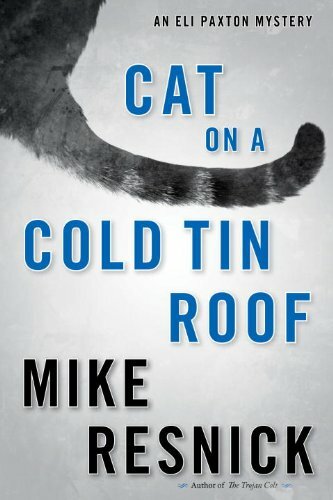 Cat on a Cold Tin Roof by Mike Resnick (Seventh Street, 2014) is the third outing for Eli Paxton who’s one of these throwback PIs. For no terribly good reason other than he’s getting on in years, this is a man who has studiously avoided the adoption of any of the modern technology the rest of the world takes for granted. That means no cellphone, no computer or internet connection, no GPS in his clunker, and so on. Like one of these actors waiting for the next bit part to break his name into the big time, he spends most of his time watching classic Hollywood noir movies on cable while keeping his dog, appropriately named Marlowe, by his side. Fortunately, he has a stellar reputation with some of his buddies in the local Cincinnati police department, and this leads to him being called out at an unGodly hour of the morning to attend the scene of a homicide. 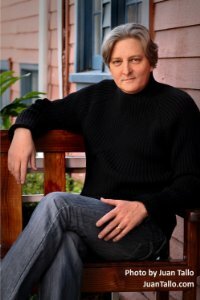 Jim Simmons believes in his own power to solve the murder, but the distinctly unhappy widow (not grieving, you understand) wants her cat, Fluffy, found ASAP if not before. This sets our dogged detective off on the trail. When Marlowe finds other cats but not the missing moggy, the angry widow has him arrested. Apparently she thinks Paxton must be finagling with the feline (possibly for ransom purposes). Having talked his way out of the calaboose, he decides to persist in tracking down the kitty, wondering why the widow thinks it so valuable. The answers are very entertaining. One of the reasons I enjoy first-person PI novels is the opportunity to watch a mind thinking through a problem. While this has no pretensions to apply strictly deductive reasoning to the analysis of facts and the process of investigating, the common sense approach on display here is a positive delight. To get the best value out of the situation, Paxton gets a sidekick. While by no means stupid, this individual is there largely to make all the elementary mistakes and to sit there applauding as Paxton sets him right. Since he’s a mob enforcer from Chicago, he’s hardly the most reliable of partners when it comes to slapping the manacles on the mouser but, in the end, he does prove his worth when the Bolivian connection comes out to play. 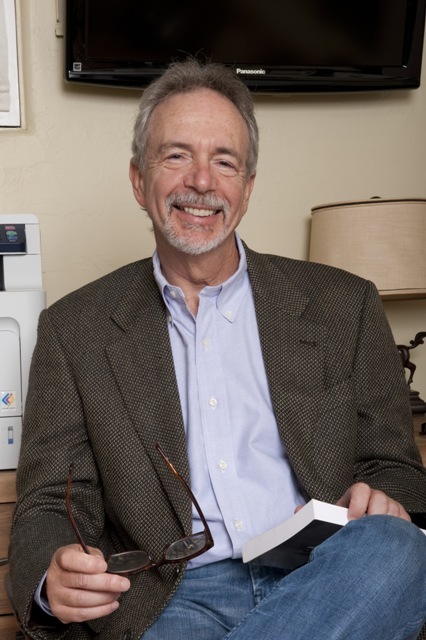 The first two Paxton novels are tied fairly directly to a competition or sporting event involving animals. 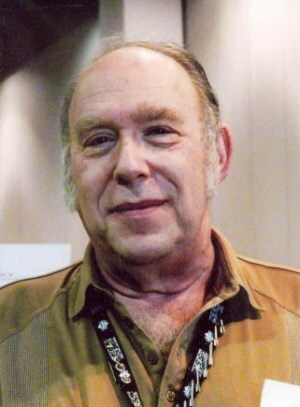 This allows Resnick to show off his considerable knowledge of dogs and horses. This novel features a tabby as the catalyst for the whole shooting match to get underway, but the whole is really a classic PI novel with no inside knowledge of felines required (although some state law might be useful). Putting the whole package together with considerable wit and style, Resnick delivers a genuinely amusing trail of breadcrumbs for our hero to follow, and although he might not end up rich on the fees earned, he does at least get the see a Bengal and live to tell the tail (sic). 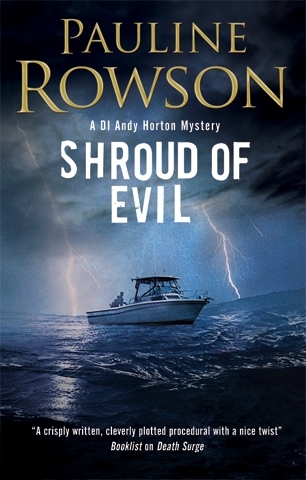 Shroud of Evil by Pauline Rowson (Severn House, 2014) sees the eleventh outing for Detective Inspector Andy Horton as he makes a guest appearance in the courts on the Isle of Wight and reviews the state of his ignorance as to what happened to his mother thirty years ago. A newspaper article read while waiting for the case to be called suggests he should try contacting Lord Eames again. Although the man has denied knowledge of his mother’s disappearance, Horton does not believe him. He therefore decides to make an unannounced visit at his estate on the coast. He’s been quietly investigating an old photograph which shows a group of six young men. Three are dead. Apart from Lord Eames, he’s not been able to track down the other two even though he has names for them: Anthony Dormand and Rory Mortimer. When he walks along the beach outside the estate, he meets an interesting man. With no-one apparently at home, he returns to base in Portsmouth, where he’s given a missing persons case. It seems a private investigator has gone AWOL. That his body later turns up on the beach outside Lord Eames’ estate on the Isle of Wight is not the kind of coincidence our hero likes. Particularly when the fact of his visit to the fringe of the estate has been recorded by surveillance cameras but not reported to the police. It seems everyone has complicated motives in play. Which leads to a more general structural point about how best to plot a long-running series. Obviously, the first books can be introductory as to characterisation and be more-or-less standalone as police procedural cases to investigate. But there comes a point when the broader narrative arcs of who these people are and how they relate to each other comes to the fore. This will tend to be when the author has begun to make decisions about how some of the plot lines are going to be resolved. There’s just one problem. Unless the main series character is going to quit his or her job and devote all available resources to solving the key personal mystery, we’re left with an uneasy balance between the cases that come along for investigation and the steps necessary to move the metanarrative along. So here we have Horton beginning to make progress in the investigation of his mother’s disappearance but, for now, Rowson wants to keep him in the Portsmouth CID. This is a convenient vehicle for providing him with appropriate resources and some degree of cover for his activities. But this also requires a series of coincidences to enable him to meet the people he needs to meet to acquire the next pieces of the puzzle. I’m not raising this issue as a complaint. In fact, this book is a very fine example of a series character making significant discoveries. The emerging backstory and explanations feel credible. For these purposes, there’s also a clever justification for there being a Portsmouth connection both when his mother disappeared and now. So I’m still impressed by this series and it’s left in a very interesting position at the end of this episode. As to the actual murder to be investigated, this has everything going for it. The murder method is unusual. Where death occurred is uncertain. The disposition of the body in an old sail as a shroud is intriguing. And there’s a serious problem in understanding the character of the victim and precisely what work he was doing. Although there seems be a reasonably clear private investigation in progress to determine whether a husband is cheating on his wife, it’s going to be a stretch to tie the potentially errant husband to the killing. Despite the links to him, he looks to have an alibi for the time the killing is likely to have taken place. This leads to the general conclusion Shroud of Evil is an excellent continuation of the series but, to get the best out of it, you must have read some of the previous books. Knowing who everyone is helps give the book added value. So there you have it. We continue to edge slowly towards a thriller or possibly MI5, more political scenario giving the broader narrative considerably more heft. For a review of another book by Pauline Rowson, see Death Surge. Galileo 2 or ガリレオ (第2期) (2013) episodes 10 and 11 are an adaptation of the novel Salvation of a Saint although the translation offered for the television adaptation is “redemption”. Having read and signalled serious admiration of the novel, there was considerable expectation as we worked through this series. No matter how superficial some of the earlier episodes might have seemed, there was enduring confidence the quality of the source material would enable the scriptwriters to produce a blockbuster ending leaving everyone impressed. Sadly, this proved not completely the case. In reaching this conclusion, I speculate my reaction to this adaptation might have been more forgiving if I had not read and enjoyed the book. By definition, novels are more detailed and allow the author the chance to build to the most effective conclusion. Even at two hours, television and cinema can struggle to capture the essence of even a short book. Look at the agonising over whether the television version of Game of Thrones is as good as, or better than, the novels from which it is drawn, or whether Peter Jackson should be burned at the crossroads for what he has done to the works of Tolkien. People who love the written word often hate what happens when their favoured novel is translated into the visual form. So, for example, there are the purists who hate the adaptations of the work by Jane Austen, the Brontë sisters, and so on. So here we go with more detailed thoughts about this plot, carefully avoiding spoilers. First, the good news. Yūki Amami as Ayane Mashiba is outstanding. She carried the two series of Boss and proves devastatingly effective as our saint. Had she failed, the entire ending would have been dead in the water. We need to be clear about the nature of this role. This is an older woman who runs her own successful nursery school. She’s desperate to have children and, not caring so much about the consequences, she dates an entrepreneur who’s also seeking immortality for his genes through producing a child. He has two women. When Ayane is the first to prove her pregnancy, he dumps the other and marries Ayane. Shortly after their marriage, Ayane is walking near their matrimonial home when she’s knocked down by a woman on a bicycle. The shock causes her to miscarry. The cyclist is never identified. Thereafter, Ayane goes above and beyond the call of duty as a wife. She regularly attends a fertility clinic and spends the rest of the time at home, attending to her husband’s every need. Nothing is too much trouble for her. When she goes away on a short holiday with two friends, her husband is very obviously alive, communicating with his employees by video conference, answering the door to their home, talking with the security guard, and so on. But at some point, he dies of arsenical poisoning. The fatal dose was obviously administered through his afternoon cup of coffee using freshly ground beans and newly boiled water. Misa Kishitani (Yuriko Yoshitaka) therefore thinks someone gained entrance to the home, placed the poison in the kettle, and waited for the man to die. The book goes to considerable lengths to demonstrate how he was not killed. 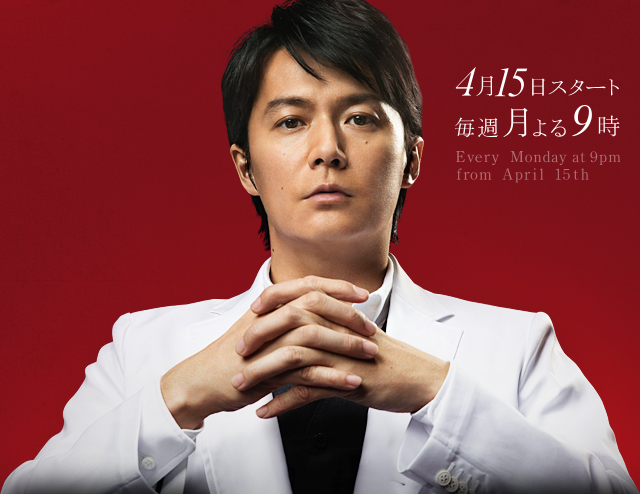 In this endeavour, the book shows Professor Manabu Yukawa (Masaharu Fukuyama) aka Galileo and the forensic team working together to analyse every aspect of the kitchen. This even includes looking at the amount of dust under the sink to show no-one has touched the water filter during the last year. In any event, he made a coffee in the morning without ill effects. So it would be impossible for the water supply to have been contaminated. The television adaptation, however, omits all this detailed work. Galileo is shown wandering around the kitchen, opening and closing cupboard doors, looking inside the fridge, and so on. He then demonstrates a possible murder method to Ayane Mashiba and the children in her school, but dismisses it because the offscreen forensic work has shown it to be impossible. In other words, by cutting out the spadework performed to show just how impossible this murder is, it undermines the shock value of how she did it. It is and will always remain, one of my all-time favourite murder methods. That said, people watching this show will understand how it was done and appreciate its cleverness. It’s just so much less than it could have been. We now come back to the question of “salvation” vs “redemption”. What the adaptation does right is bring out the quality of the woman and to explain very clearly what her motive was and why the world was right in viewing her as a saint in her marriage. You may very well wonder why a woman who endlessly proved her love for her husband should want to kill him. Read the book. If that’s not available to you, watch this television adaptation. It’s entirely understandable. So if Galileo succeeds in proving how she did it, can she be “saved” or find redemption? There are some who might say that the deliberate killing of another human being can never be forgiven. Unlike a theft where the money or the value of the thing taken can be returned to the victim, only society, perhaps influenced by the wishes of the victim’s family, could ever forgive and allow rehabilitation. I leave it to you to decide. For the Galileo novel on which this pair of episodes is based, see Salvation of a Saint. Like most people, I have many faults. Some are minor, others neutral in their effect on me and my life. Among the latter is my somewhat obsessional approach to reading. 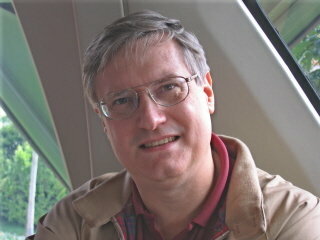 If I find an author who hits the spot, I try to read all his or her work. 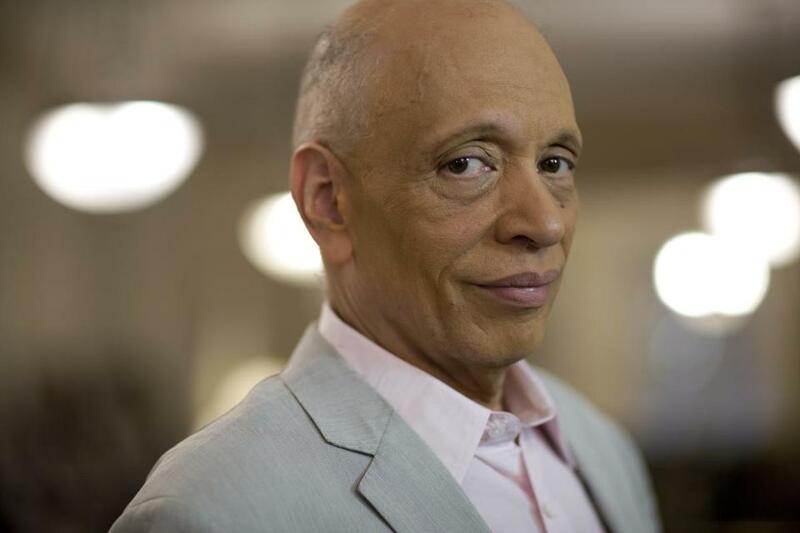 Numbered in this select band is Walter Mosley whose work I’ve been reading for the last twenty years. Although I confess to finding some of his science fiction and more metaphorical fiction didactic and less interesting, I have persevered. 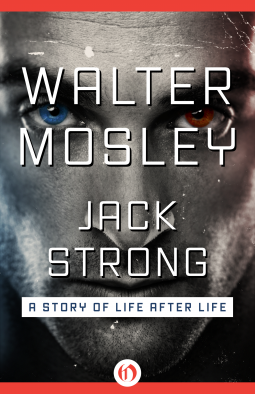 Which brings me to Jack Strong (Open Road Media, 2014) This boasts the subtitle: A story of life after life. This is novella length and obviously intended as the first two chapters of a novel, which is slightly unfortunate, because unlike a formally constructed short story/novelette which reaches a natural conclusion, this stops rather arbitrarily as our titular protagonist leaves the nest of his awakening and sets off on his quest. We’re back in the land populated by one of the fairly standard SFnal ideas. This time, we’re following along the track developed by Lois McMaster Bujold in Mirror Dance where a man not only develops multiple personalities, but gets some degree of control over which personality shall take the wheel, given the needs of the particular circumstances. Our protagonist, Jack Strong, seems to be in the same situation as Donovan in the series of Spiral Arm novels by Michael Flynn in that the multiple personalities have been induced artificially. In the first pages of this ebook, Jack dreams scenes from the lives of many people. When he wakes, he finds himself in a fairly anonymous hotel room. When he comes down to reception, he discovers his room has been paid in advance and that his car is parked outside. As he slowly comes to full consciousness, he begins to realise he has access to the memories and abilities of many people. These are real people but they seem to be dead, i.e. we’re blurring the genre line with fantasy and supernatural elements. They represent a cross section of the community including individuals from both ends of the spectrum of good and evil. One might be a serial killer who moved around the country hitch-hiking. Another might have been a priest of rare knowledge and high spiritual morality. In between comes the mass of humanity. Some faceless and only possessing minor skills and abilities. Others were highly trained as soldiers or gamblers, grifters and criminals. In other words, Jack has a wealth of experience and abilities to call on but, if this is a democracy, getting many of these personalities to agree on any particular course of action is challenging. The first personality to begin influencing Jack’s actions turns out to be on the hit-list of some local gangsters. Because this fact is not immediately obvious to Jack, he inadvertently finds himself in extreme danger and has to go on from there. Fortunately, he has another personality who was in the FBI and is able to make contact with a real-world person who can help out. So, for the length of this relatively short extract, we’re in fairly well-travelled territory as our hero who finds himself in the body of a crook has to extricate himself and find somewhere safe to hide. While this is playing out, he also becomes aware of a man monitoring his actions. Presumably, as the novel progresses, we will see this as representing the essential mystery to solve. Who has performed this “scientific marvel” by collecting all these people together in one body? What is their purpose? and so on. As it stands, it’s pushing all the right buttons and ends frustratingly as he leaves Las Vegas for points unknown. Hopefully, the rest of the book will be completed soon and we’ll all be able to see whether the idea develops coherently and finishes satisfactorily. So far, so good, i.e. I recommend it as vintage Mosley and, hopefully, he’ll keep away from his tendency to didacticism and stay with the action plotting.